Minnesotans on Marriage: Our Side is Nicer. And Has More Fun. Next installment in the series, Why Minnesotans Won’t Stop the Conversation About Marriage. I meant to post a few pictures from and thoughts about Pride weekend yesterday, but the Supreme Court got in the way. 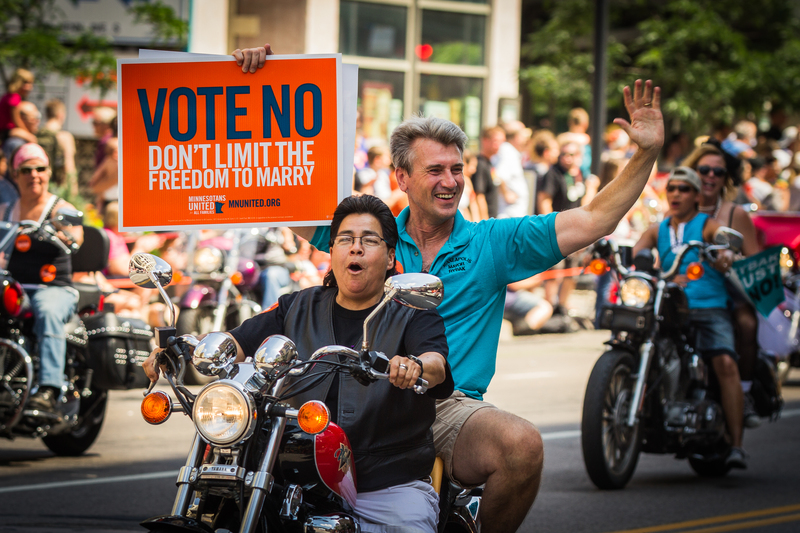 Probably my favorite image of the day – Mayor Rybak and one of the bikers who led the parade. Saturday morning I drove across downtown to get to a friend’s fundraiser. At around 10:15am, every street corner along Hennepin had a couple people in orange “Vote No” t-shirts and shopping carts (sorry–I was corrected– “freedom carts) from where they drew Pledge to Vote No Cards and collected donations. The Minnesotans United for All Families campaign filled 7,000 volunteers shifts over the weekend.The offices off of Loring Park were crawling with people from morning to night with folks coming in and being sent off on canvassing shifts through the park and neighborhoods surrounding downtown. And then there was the parade. Things got started with about 150 people joining a flash mob before the parade got under way. For only the second time in the history of Pride (the first being last year) a sitting Minnesota Governor marched with the Parade. The governor, who pledged as soon as the Republican legislature put the amendment on the ballot, to fight it “with every fiber of my being,” had kicked off the week with a Governor’s Pride Reception benefiting Minnesotans United. I was reminded during all the fun –but especially by all the passion and commitment of Minnesotans United volunteers– of the other side. 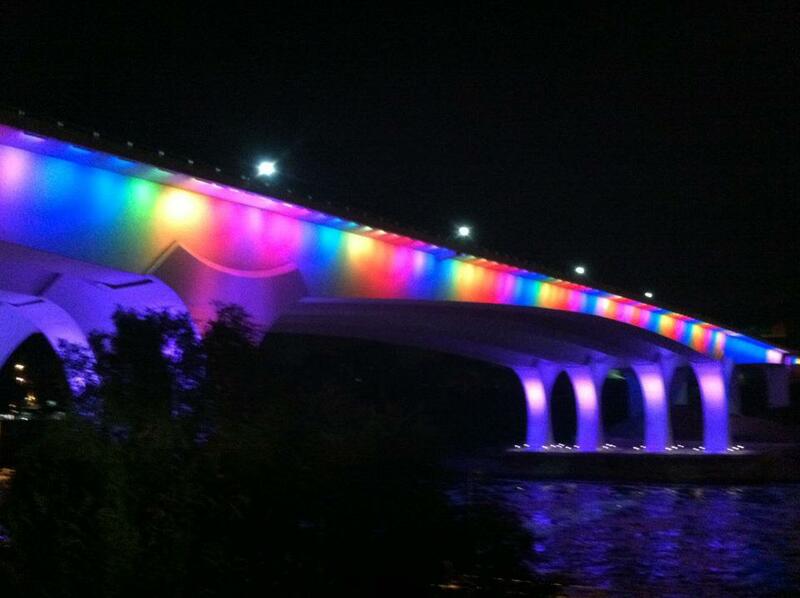 The 35W Bridge was illuminated all week by a Pride Rainbow. I could be wrong about this, but I really don’t think the sight of angry sidewalk protests against a corporation’s benign (and principled) support for equal rights is optically smart for those who are trying to deny animus towards LGBT people. When it comes to those opposed to LGBT rights, people associate these kinds of protests with street preachers and Pride condemners and funeral protestors. It doesn’t read as politically pragmatic—it reads as Fred Phelps. While our opponents will be burning Cheerios this week, the good folks at Drinking Liberally will be collecting General Mills food products to donate to local charities. I’m telling you – our side is nicer. 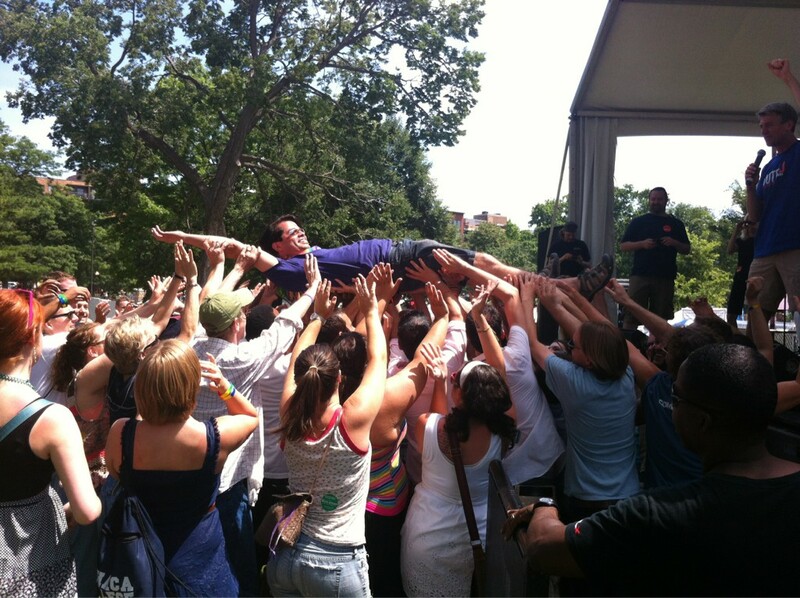 I was a guinea pig in Mayor Rybak’s impromptu crowd surfing fundraiser for Minnesotans United.